Fox 10 Phoenix reports that a small but dedicated group of Arizona cavers started digging at the back of the popular tourist cave where they could feel a breeze blowing through a crack. The group worked tirelessly for years until they stumbled upon an entrance to a new section, never seen before by human eyes. Inside crystal formations line on the ceiling, while others fill the floor. So far only a small number of visitors have entered the new section. Although the find is exciting, this breakthrough is believed to be just the beginning of a much larger passage. First explored in the 1920’s, Grand Canyon Caverns are the largest dry caverns in the United States. 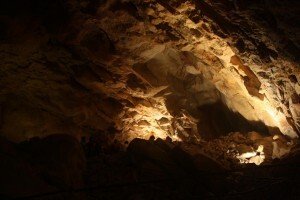 It is characterized by its lack of stalagmites and stalactites. Ask Cavers: What is your Most Successful Cave Dig? I have heard rumors by “America Unearthed” TV show of an Egyptian Settlement located in an immense cave located in the Grand Canyon. It is reported that the Govt. forbids any entering into cavern system. Being highly curious, I want to obtain more info on this.